Please see our updated Mars Reference Page. The surface of Mars is more interesting than most planets. 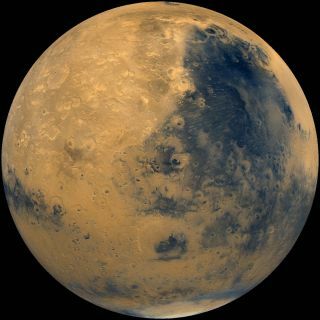 Like Mercury, Venus and Earth, Mars is mostly rock and metal. Mountains and craters scar the rugged terrain. The dust, an iron oxide, gives the planet its reddish cast. A thin atmosphere and an elliptical orbit combine to create temperature fluctuations ranging from minus 207 degrees Fahrenheit to a comfortable 80 degrees Fahrenheit on summer days (if you are at the equator). Researchers have recently monitored huge storms swirling on Mars (like this one). The storms are very similar to hurricanes on Earth. In 1938, Orson Welles broadcast an Americanized version of a 40-year-old British novel by H.G. Wells — The War of the Worlds. The radio drama was perceived by many as a real newscast about a Martian invasion near Princeton, New Jersey.